The most general and far-reaching standard package on the market. Specially developed with the medical zone in mind. Remains fully set for a number of days without needing any re-inflation. Easy tent dock with Velcro fastener. First aid tent at large events. Operation control center for aid organizations. Medical care tent for large-scale operations. Screening facility for treatment of injuries. The Warrior tent is a barrel shaped frame tent with waterproof canvas covers. The warrior tent can be used for various applications such as accommodation, mobile hospitals, kitchen and dining. we included all these aspect in a stunning, yet realistic product to African countries. We prefer the most proper raw materials there must be exacting consideration and emphasis given to the realistic needs of the consumer, jointly with aesthetically beautiful features. Faster assemble and disassemble as well as easy handling Series supports you immensely in all operational situations. Select the tent size you require from four different models. Or erect complete tent towns using the docking tent.Warrior tent is perfectly equipped for various scenarios thanks to its optimum usable width and the well conceived functions. 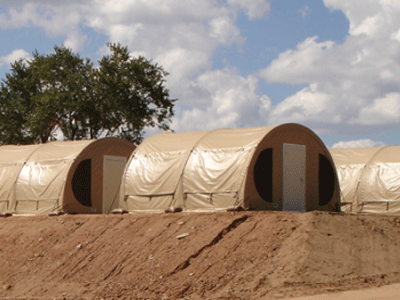 Disaster Tents are Manufacturers, Suppliers & Wholesalers of Safari Bow Tents. Buy tents for sale online like Safari Bow Tents, Cottage Ridge Tents, Warrior Tents, Hip Roof Tents, Luxury Camping Tents, Emergency Tents, Army Tents, Military Tents, Medical Tents, Disaster Tents, Relief Tents, Emergency Shelter Tents & Refugee Tents.We supply tents to countries like South Africa, Zambia, Zimbabwe, Angola, Swaziland, Namibia, Nigeria, Lesotho, Mozambique, Kenya and Botswana.